blog Announcements JournoLink 3.0: We've upgraded the platform! JournoLink 3.0: We've upgraded the platform! Our lives are full of change and we all say we hate it! So why do we do it when we all like the familiarity of our old carpet slippers and resist binning them literally until they have fallen apart and even the dog has stopped chewing them. When things wear out we have no choice, but when they don’t it’s more keeping up with the trends, and no more so in the world of business and especially technology. Making sure our product is as good as the latest one launched, or better still, leading the innovation. And that’s what we are doing at JournoLink. We are keeping the familiarity so the businesses on the platform do just as they have always done in using it, and it looks more or less the same too. But we are adding some clever new features that will enable businesses to do more and stay ahead of their competitors in their PR presence. We have quietly listened to businesses, we have watched what others in the PR market are doing and we have put our forward-thinking glasses on and challenged ourselves on what we think our customers will love us for going forward. 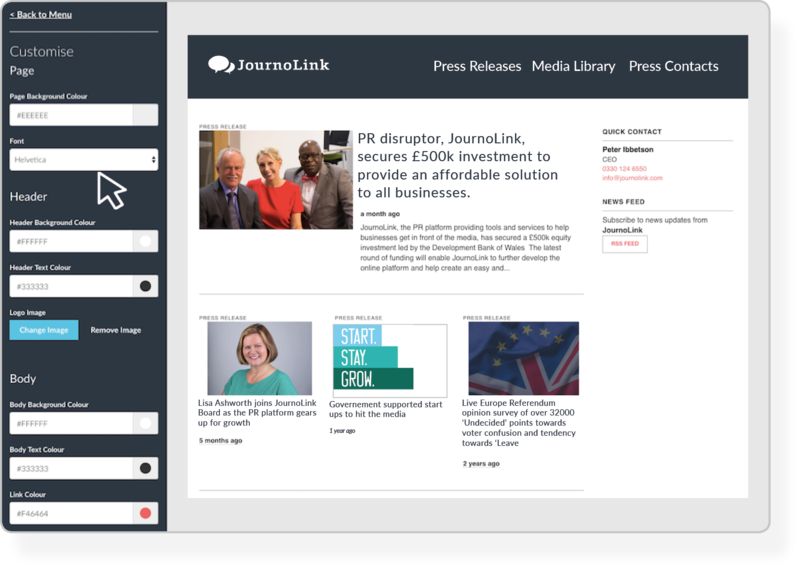 PR is all about profiling businesses brands, so we have rebuilt the Press Room feature on JournoLink. We’ve actually created a Press NewsRoom service which a business can use as its heart on its website, not only automatically updating every time the business uses JournoLink, but also letting it add media images, marketing collateral, social media activity, contact details and the like, all branded with the right look and feel for their business. Through a simple link which JournoLink gives the business, our customers will now have a dynamic News Room as good as any big business, but without the cost. Different options to customise the page are available depending on the package you choose. Some businesses have more than one brand, and they just hate paying twice for the same service. So we’ve built in a multi-account feature. Now through just one subscription businesses can add additional brands without having to pay extra. Also, we've introduced a multi-sign-ins feature, to allow teams to work together on a single account. Some businesses have already put together a media list. JournoLink now lets you upload your database to the platform so that you can create your own lists and schedule your press releases at a different time for each of them. We’ve responded to our customers’ inbuilt demand for feedback too. Now, when a press release is sent, JournoLink will tell you not only how many journalist targets we have sent it to, but also which titles have shown an interest, as well as the ones who have gone beyond just a quick look. 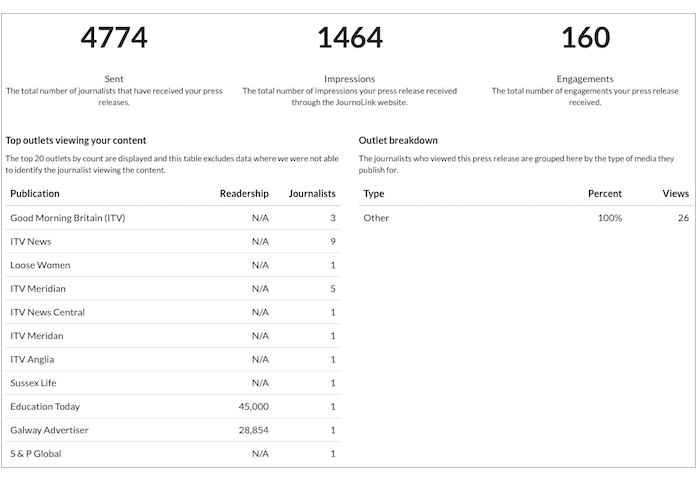 On the same theme, many businesses now use Google Analytics, so businesses can now just put their Tracking IDs into JournoLink to track who is looking at the Press News Room. There is no better way of creating a hot leads list. There are more little upgrades that we think our customers will find magical, but throughout the whole exercise we’ve kept our carpet slippers on. We are the same JournoLink, we work in the same way and are sticking to our mantra of making it ‘Simple and Affordable’ for businesses to link in with journalists and the media. If you'd like to explore the new platform, create an account for free now. We've been named one of the most disruptive British businesses in 2016!